Wall Street stocks rose early on Tuesday, continuing an upward trend, following strong economic reports from Germany and Britain. 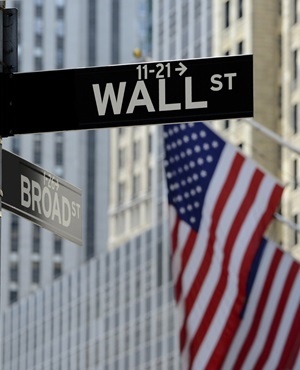 About 10 minutes into trading, the Dow Jones Industrial Average was at 26 044.58, up 0.5%. The broad-based S&P 500 also gained 0.5% to 2 844.75, while the tech-rich Nasdaq Composite Index advanced 0.4% to 7 743.17. The S&P 500 has added almost 4% since March 8. Data released on Tuesday showed the British unemployment rate hit a 44-year low despite a broader economic slowdown as Brexit looms. Also, the closely-watched ZEW institutes monthly investor confidence index surged in March as fears of a hard Brexit receded and progress in US-China trade talks soothed nerves. The two reports "helped stoke the narrative that the global economy is bottoming (or has bottomed)," said Briefing.com analyst Patrick O'Hare, who also cited favourable central bank policies as a support for the latest upturn in stocks. The Federal Reserve kicks off a two-day policy meeting later on Tuesday. The US central bank is expected to keep interest rates unchanged and could signal it anticipates fewer interest rate hikes in 2019.